Soak City is becoming Cedar Point Shores Water Park in 2017. Cedar Point, the roller coaster capital of Sandusky, Ohio, has announced several new projects for 2017, including the transformation of Soak City to the new 18-acre Cedar Point Shores Water Park, and an expansion and transformation of Breakers Express will transform into Cedar Point’s Express Hotel. · Point Plummet – a six-story-tall, four-person aqua-drop body slide that will simultaneously send four guests on a nearly vertical free fall when the floor drops out from under them. The four separate 400-foot-long slides will send riders through a series of flat loops and s-curves. · Starboard Surge & Portside Plunge – located on the same structure as Point Plummet, these two, five-story tube slides can accommodate guests riding alone or with a friend and will send them through an enclosed tunnel before shooting them out into the sun through drops and turns. 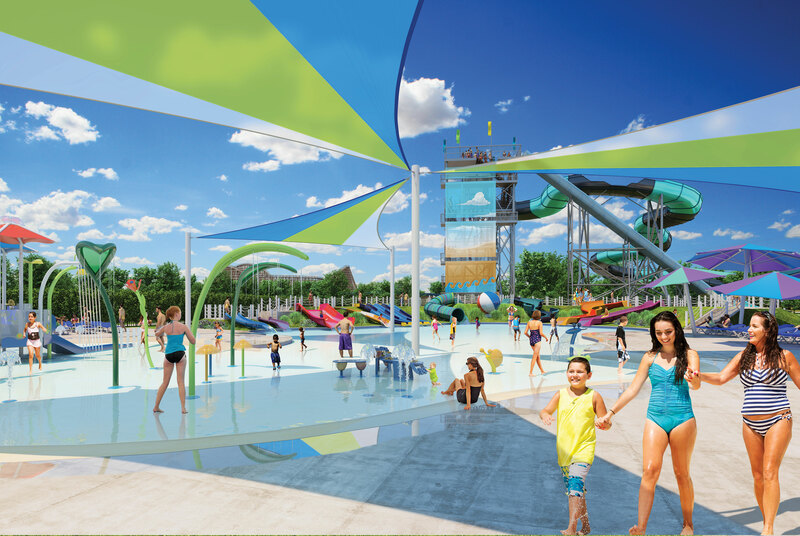 · Lakeslide Landing – a new family splashground with 12 kid-sized water slides that line the perimeter of a zero-depth-entry pool, shade structures, and an oversized lounge and sun deck area. 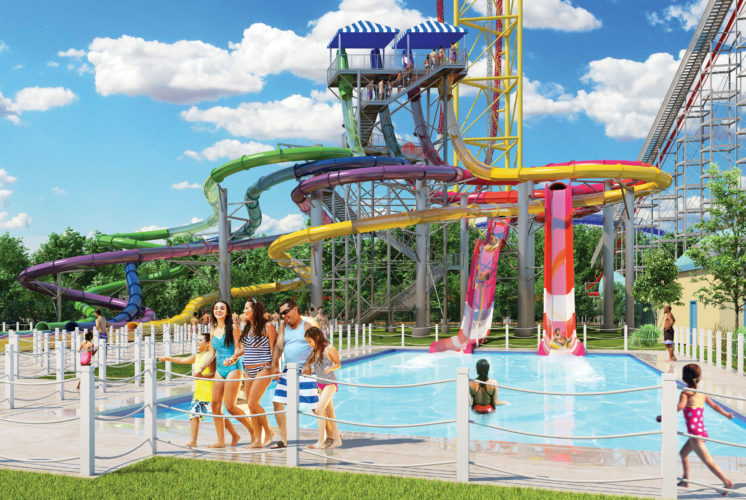 The water park’s existing slides and attractions will receive makeovers as well, with most receiving new names highlighting the beachside location. The new Crystal Rock Café will cook up items like fresh-baked flat breads with options such as caprese or buffalo mac & cheese; farm stand salad options like crispy chicken BLT, Asian chicken and chicken Caesar; pesto-glazed grilled chicken sandwiches; fresh-breaded chicken tenders; cheeseburgers; bratwurst; waffle fries; tater tots and more. Updated cabanas on either side of the massive 500,000-gallon wave pool will include free Wi-Fi, charging stations, ceiling fans, TVs and dedicated food and beverage service. The 2017 Platinum Pass includes unlimited admission to Cedar Point and Cedar Point Shores, Early Entry, free parking, exclusive ride nights, in-park discounts and more. Guests can purchase their 2017 Platinum Pass beginning Saturday, Aug. 20 at cedarpoint.com. In addition to the new Cedar Point Shores Water Park, Cedar Point also announced several enhancements to its overnight accommodations. In 2017, Breakers Express will transform into Cedar Point’s Express Hotel, adding 69 new rooms to the property. 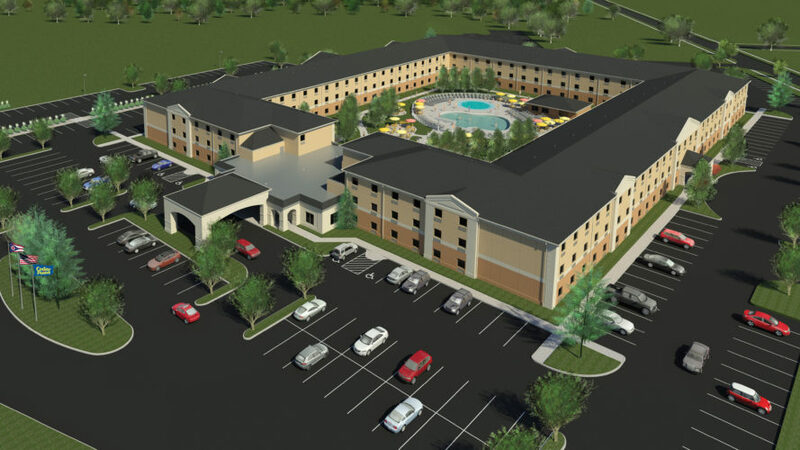 All guest rooms feature two queen beds and will be completely renovated with new bathrooms and bedding, mini fridges, microwaves and connecting family suites. In the center of the property, a new splash pad and an outdoor courtyard featuring conversational living spaces will join the swimming pool and deck area. Construction on Cedar Point’s Express Hotel is already in progress and will last throughout the winter. The Hotel Breakers, Cedar Point’s signature hotel located right next to Cedar Point Shores, is also growing. Following a complete renovation in 2015, an additional six-story tower will be added to the beachfront property. The new tower will match the exterior of the existing hotel and will house 158 guest rooms with many of them configured as connecting family suites. A new outdoor pool area will also make its debut alongside the tower. Construction on the addition will begin after Labor Day and will continue through the 2017 season. It will open to new guests in time for the summer of 2018. With the new tower, Hotel Breakers will have a total of 669 rooms, making it one of the largest hotels on the Great Lakes. Guests who stay at Cedar Point’s Express Hotel, Hotel Breakers and the park’s three additional properties receive Early Entry, allowing access to Cedar Point one hour before the general public to ride some of the biggest attractions, and park tickets that include free admission to Cedar Point Shores for the length of their chosen 1-day, 2-day or 3-day ticket).